Medusa: LARISSA'S STORY: "IT'S SO MUCH EASIER TO FALL INTO AN EATING DISORDER THAN TO GET BACK OUT AGAIN"
"I am 15 and from London. I thought I'd share my story with you just because I've never shared it with anyone. 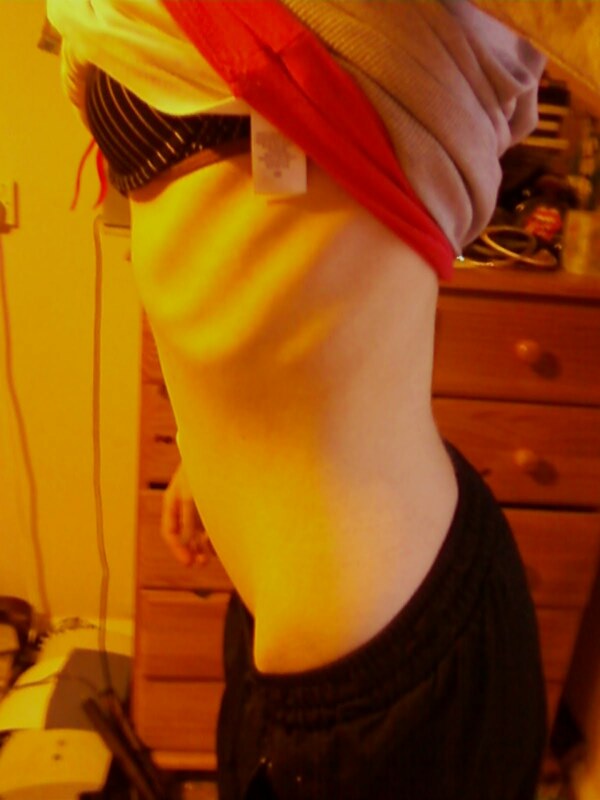 I've had anorexia/bulimia for 2 years. It all started simply because of a special k diet, and once I realised this, I was so alarmed by how easily I fell into the cruel world I'm now stuck in. I was overweight (185lbs at 5'2) and decided I'd go on the diet just for fun with a friend to lose a few pounds. I lost 7lbs in 2 weeks and I was ecstatic. So when my friend had finished she just simply continued on with normal eating, whereas I carried on. It was nothing severe at first, just watching what I ate, everything healthy. 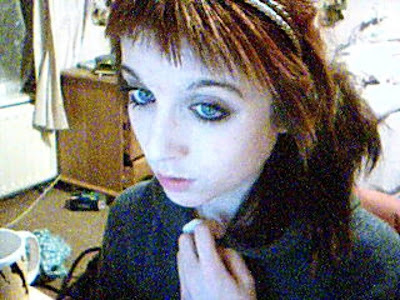 Then by spring 2009 I was eating around 1200 calories and becoming obsessed with exercise. It stayed like that for a few months, until around May I was eating 1000 calories a day with 3 solid hours of exercise. I thought there was nothing wrong with me. I remember not letting myself sleep until I'd done exactly 180 minutes of jogging on the spot, the exact same spot in my room with my ipod on. I'd create playlists that would add up to this time and just jog and jog and jog. "Me before at about 140lbs (after around 45lbs weightloss)"
Over the summer holidays, it became worse. I was out all the time and eating on the go or not at all, you could say. I went back to school in September and everyone was staring at me and asking me if I was okay but I couldn't understand why. I wasn't underweight, just the change was so quick. I still thought I was fine. By October I was eating around 500 calories a day, still with my exercise, and then mid-way through October I got ill with a stomach bug. I was so happy. It was just a quick fix for losing weight. I didn't even need my appetite suppressants. I lost 10lbs in a week. When I went back to school, my form tutor took me to the side and had a talk with me. She knew what was going on. She had dealt with it in her previous schools. I didn't know what to do. I screamed and cried for hours in her classroom about the fact someone knew about my secret. It's something you never want anyone to find out ever. So she urged me to go to the doctors and I did. It had now taken me 18 months to accept I had a problem. I had my appointment the first day of the October half term, and I was so scared that I began eating up to 8000 calories a day and just throwing it all back up again. Even after the appointment, it carried on all week. I just couldn't stop. Then I found laxatives. I started off just taking the recommended dose of 2 and would only take them after binges. I lost all the weight I gained from the binging and purging then went back to my restricting in November. I now weighed about 100lbs at 5'4. I got referred to Maudsley Eating Disorders Clinic in London in November, but my appointment wasn't until December. So I did all I could to lose as much weight as possible between that time. I was taking about 20 laxatives a day and eating around 200 calories a day. I felt physically dead but I was euphoric about the weight just falling off of me. I'd cling onto my own collar bones obsessively and measure my wrists constantly to make sure they were still small enough. Anyone would think I would want to be heavier for my first weighing, but I just felt I needed to deserve the treatment so I had to be as skinny as possible. By the time I'd gone there, I'd lost a further 10-20lbs and I was emaciated. I still thought I was fat. "Picture of my stomach after the 8000 calorie binge that lead to me attempting suicide"
I continued losing weight even attending appointments and I was about a pound away from being hospitalised. Then at Christmas I just got so hungry I started eating everything I could see for about 2 weeks. I hated myself for it and attempted suicide twice and self-harmed constantly. 3 months later, and my weight is stable, but I am not. I now weigh 120lbs at 5'4, but my relapses are all too regular. I think I’m writing this just to show people that it is so much easier to fall into an eating disorder than to get back out again. I was expecting all my psychologists just to wave a magic wand and I'd be able to eat again, but it's far from that. I wouldn't wish an eating disorder on my worst enemy, so it pains me to hear people around me talking about how much they want to be thin. It's not worth it. Even though I know eating disorders aren't solely around wanting to be thin and fit in a size 0, there's so much more to them, but that's how it starts. Losing weight won’t make your life better. I thought it would mine and it's done completely the opposite. So if this does get published, I urge anyone reading this who thinks that being thin is the answer to please re-think it, and try and live as happy a life as you can. I can't comment on recovery yet, as I'm still far from being able to call myself recovered, but I'll let you know how it goes. I share experiences with you... I had an anorexic stage when I was about your age, and now almost everyone thinks I've been "cured" for years. In fact, I've been bulimic ever since I gained back the weight. Out of sight isn't out of mind. Keep strong, I'll try to too! I Totally relate to you, i've been recovering from anorexia since September, each and every day is so hard! my weight is stable now, at like 50kg o.O hate it, but i know i'm at a good weight, i was at like 32kg before i started eating again, i like you was about a pound away from being hospitalized, it's so scary thinking about how close I got to death, at the time I didn't care at all though, I just wanted it all to end! I only have one picture of when i was really low in weight, for some reason i'd take pictures but then delete them straight away! I'm happy at where I am now, for the case that I'm less tired, have more energy, but I still can't look at myself without hating the way I look! my myspace link is here if you want to add, if you have fb just search Nic Holmes, i'll be there somewhere I hope you continue to do well in your recovery! Dont give up! Its a long journey but I m sure that you ll be ok. 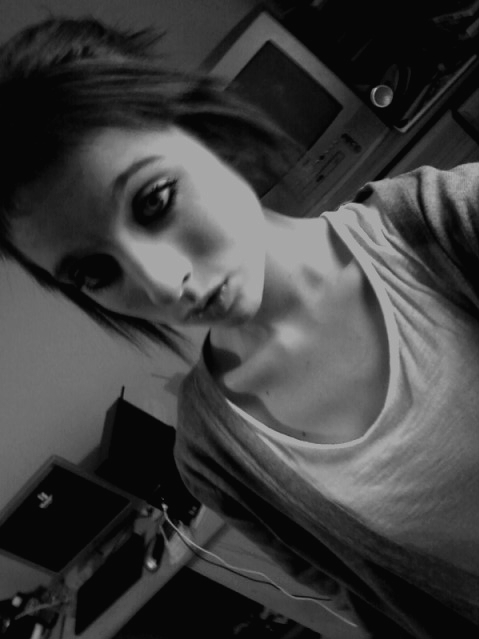 I used to be anorexic , now i am bulimic and a cutter but i wont give in . I will fight for my rights to live and love, be loved and free. I think there's nobody who ever really recovers from anorexia. There'll always be some triggers in life. I'm living with an eating disorder for about 5/6 years now. I've been hospitalised, spent 2 years at different clinics but I'm still not recoverd. I'm stable in weight now, but thats only because I binge and purge a lot atm. I hate my fat belly&hips&legs. I just want to be thin again. The first step to recovery (after admitting you have a problem) is to want to do something about it. I dont want to get better. Though I wished for over a thousend times, eating disorders didn't excist. But they do and "we" have to live with it. I read your story & just want to say how much in common the start of our eating disorders were. I started my diet with the Special K diet also. My sister & I did it and afterwards I continued to be overly obsessed with exercise & it led to my 3 year battle getting down to 70 pounds. I just thought it was really weird how we both got into it starting out with that diet. Maybe it's not such a good diet for young teenagers, I think. Thank you so much for you story Larissa. I found this site from a link Marilyn Wann posted in one of her Salon articles about fat acceptance. I really understand how you feel, as I ended up engaging in some eating disordered behaviors after starting Weight Watchers. I don't even remember doing so, but I'm sure I did. The problem with Weight Watchers and diet groups, is even though they say you can leave after you reach your target goal, they'll stil try to reel you in with "You can still lose more weight!" It's really training you in how to be eating disordered. I also dislike Special K and how they've been ripping off fat acceptance messages to their own means. First they ripped off Marilyn's Yay! scale. Now they've ripped off Queen Latifah's message that clothing shouldn't have a size. I mean really, how manipulative is the message that jeans shouldn't have any size, but you still should lose weight regardless! What? Seriously, that ad makes me mad everytime I see it. Maybe someone should petition them to stop ripping off good FA messages, and turning them into weight loss messages. I also suffer from an eating disorder - but after spending around 18months in hospitals/clinics - I'm actually getting somewhere :) ! I've got stuff I look forward to now - instead of not caring any more. can all find some reason to smile each day - whether it's a song on the radio or getting a hug from that guy you like (one of the major up's I've found of being back in the "normal world2 - sounds way cliché) . I Just wanted to share something that worked for me. I have been on and off my ED from ages 13 to 19. Either I'd restrict, B/P or exercise like crazy. Upon entering college, I started cognitive therapy. Me and My therapist would talk about my triggers and possible ways to avoid them. I was also seeing a health specialist, to make sure my body was healing. I had Amenorrhea for 13 months straight. My bone density was low, diagnosing me with osteopenia. 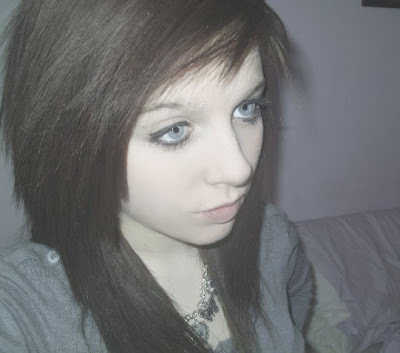 My skin was horrible, my dark circles extremely vivid. I also had a higher level of amylose in my blood; My heart rate jumped dramatically from when I was sitting to when I stood up. Yes I had all the horrible symptoms of a chronic sufferer. The extent of my illness would decrease from time to time, depending on the amount of stress I was in. Cognitive therapy helped me to an extent, because I could now share the inner secret with another human being. It made me stop blaming myself for what I did. After a year or so of seeing a therapist, I started seeing a psychologist. She prescribed Prozac to me. Ever since, I am happy to say, I have steered away from B/P completely. I am getting my period normal every month, my dark circles have diminished and my heart no longer paces out of control. I am probably not recovered completely but I have hit a major mile stone. I just wanted to share the power of medication. Believe it or not, ED is beyond a psychological problem. It is actually caused by a physiological abnormality; for me I know it was due to reduced seratonin levels in my brain. I hope this turns out to be the ultimate cure for me and I hit my 6 month goal. All in all, Prozac is definitely worth a shot! Thank you for sharing your story. I was also anorexic in college. I ate 1000 calories a day then down to 500 and even 300 some days. I am a type A personality and was studyifng premed so I was always very stressed. For some reason I needed full control of something in my life and I chose food. I exersized over 2 hours a day after studying for hours, not eating anything at the library and just drinl8ng coffee. I would run 6 to 8 miles a day on 500 calories or less. I forgot to mention I went thru a bad breakup during my freshman year that prolly caused some of this. I went from 125 lbs down to 80 lbs in alittle over a year. I would say I was fine and everytime I visited home from college my family would glare at me with sad looks but they never brought my weight up in conversation until I got down to about 80 lbs. I hated myself more and more the thinner I got but I felt joy in eating as little as possible. I had no friends bc I was scared of going out to eat with them. I would suffer from nightsweats and one day I ran into my ex when he asked if I was alright. I lied and replied yes. We both knew I wasnt. I dont remember when but one day I just knew this would be the end of me. I was the cause of my own premature death. What I was doing was a sin in Gods eyes. I began to research the harmful effects of eating disorders and thats what scared me into getting better. If I wanted to be a doctor, I couldnt live like this. Id be the biggest hypocrite on earth. I began to eat about 3000 calories a day then down to 2000 then 1600 without exersize since im only 5'2'' and ive slowly lowered it. Ive gained back almost all of my weight and am at 114 lbs and wanna gain alittle more. I lift weights only to rebuild muscle I lost. I feel so much happier and I want others to know if I could do it they can too. Im not a strong person. It was difficult but remember that nothing is impossible. I hope to become a great doctor and sjare my story with my patients suffering from what I used to suffer from and let them know there is hope.